Full disclosure, I had to replace the closest two tomato plants after a damaging hail storm that occurred just a few days after I took the June photos. The farthest tomato plant got some damage but it seems to have benefited from the beating it received! The other two original plants were beat down to a mushy pulp. Nine cucumber plants came up from the seeds I planted and, after monsoon rains last week and highs in the 90's the past few days, they are going gangbusters! I got some questions on what is all around the plants. It is grass clippings from when we mow. It really helps to keep the moisture in as well as keep the soil temperature more even. The cucs seem to love it! 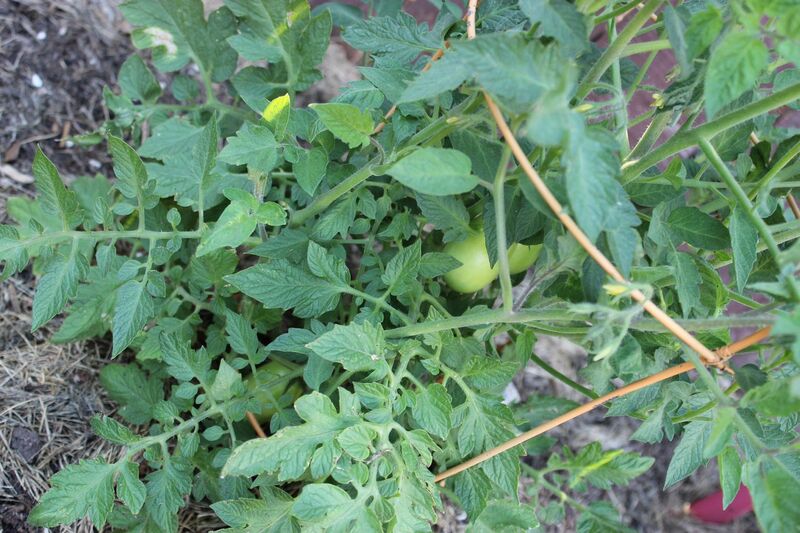 If you look closely, you can see a couple of Roma tomatoes coming along. 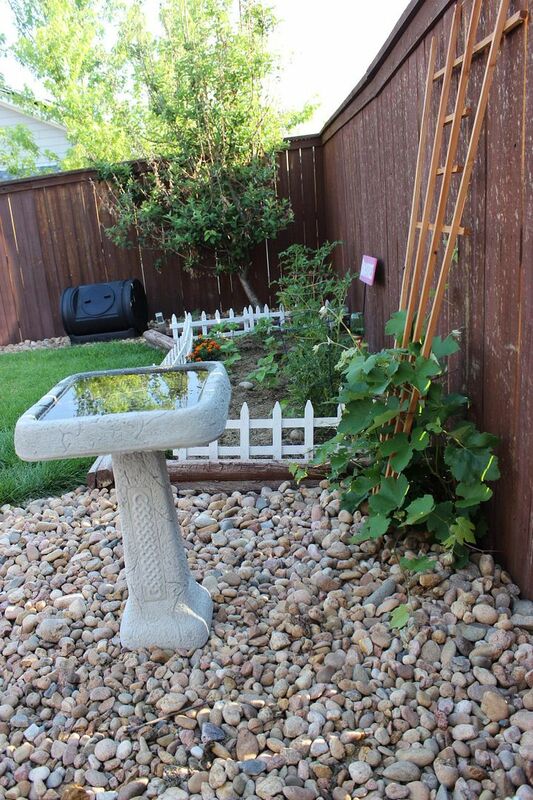 I broke down and bought a trellis for the grape plant the previous home owners had planted and, although it took a pretty good pounding from the hail, it is going strong. Mr. B is pretty excited about it even though I told him it may be a few years before we see actual grapes. I have seen birds at the bird bath and that makes ME happy! Hopefully Mr. B beats them to the grapes if/ when they come in LOL! 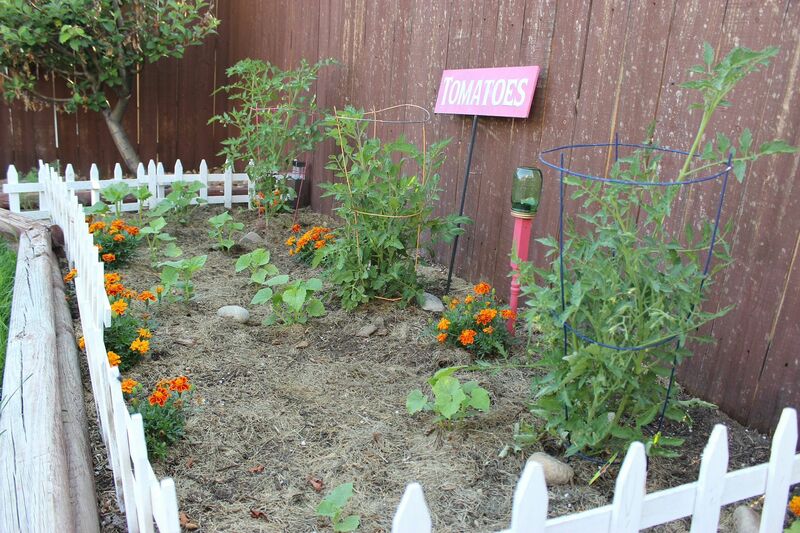 My little Grandchildren garden is doing pretty well considering it is it's first year. I smile every time I go to water it! Bad photo alert! I was trying to beat the sun before it came over the fence, but you can see I finally have my sign up that I made for the shed at our old house. You can also see the damage the hail did to the fence. Mr. B says it looks like it's got freckles. The hail actually put small divots into our wood deck! 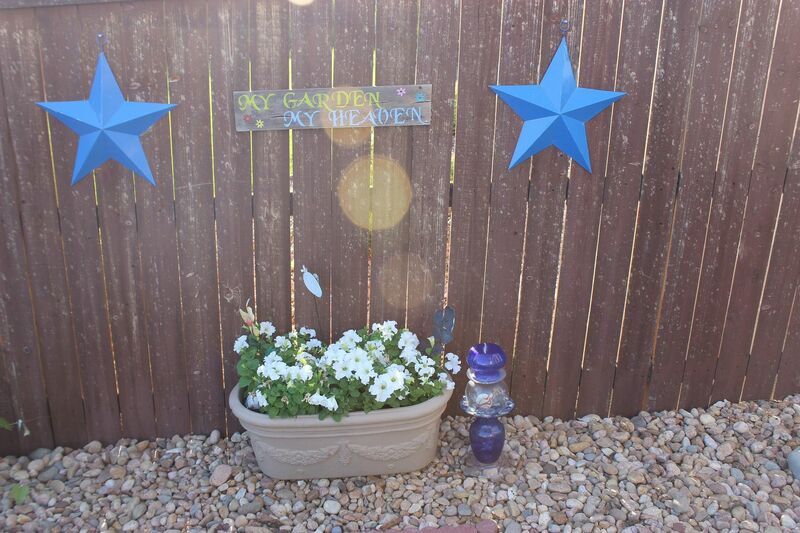 The star of the garden right now is the planter behind the Grandchilden garden. You have to really look hard to see the blackberry bush I have planted in the center of the container. 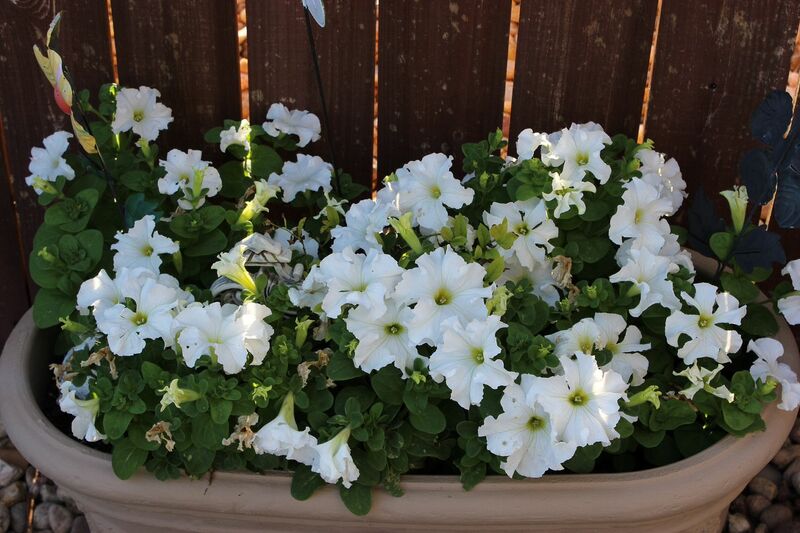 I had only planted six very small petunias here and they have taken off! I'm not sure if it was the hail beating them up or the coffee grounds I was advised to add to bring up the acid level in the soil. I am going to try coffee grounds in all of my pots next year just in case that is it LOL! There are times when I miss all of the space that my previous garden had, but then I remember how much work it was, and how I really never got to just sit back and enjoy it. With my new smaller spaces I can relax with a glass of iced tea and not have an aching back! The coffee grounds are doing wonders, you should try spot composting...its composting for cheaters like me who are lazy and don't want to turn a compost bin....just dig a small hole with your trowel and dump in old paper towels, kitchen scraps (everything can go in except milk and bones) and cover with dirt! I put in leftover lettuce, egg shells and sometimes even cut flowers that have wilted....Ohh and pasta water too! used and cooled pasta water as long as you don't use a lot of salt in it...When you dig next year and see a ton of earth worms you'll know you hit pay dirt! Kathe I think everything looks great! 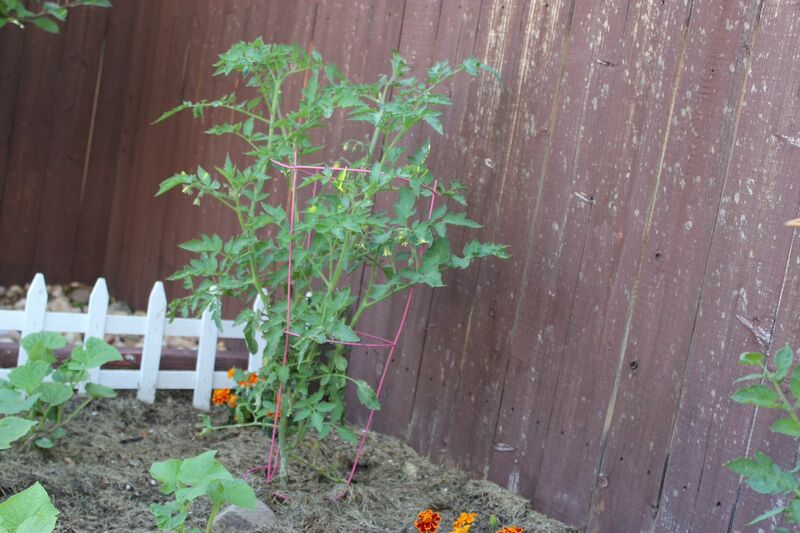 Sara has tomatoes on her plants! 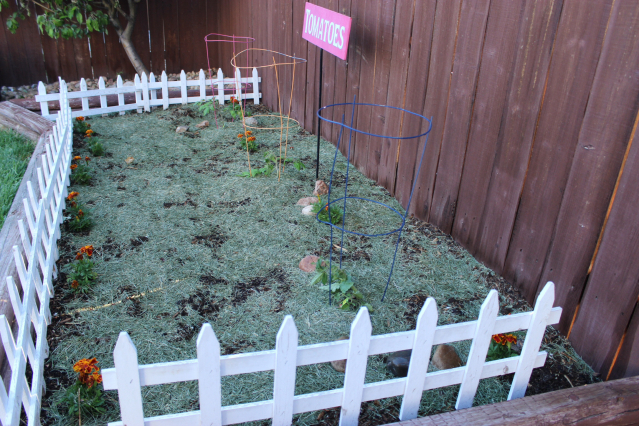 This is her first attempt at growing veggies and she and Tiger are having a great time doing it. Love the Grand Garden so much! I didn't have a garden last year or this year. I wish I had made the time but work was very busy with a deadline and I've had a hard time even keeping up with blogging. 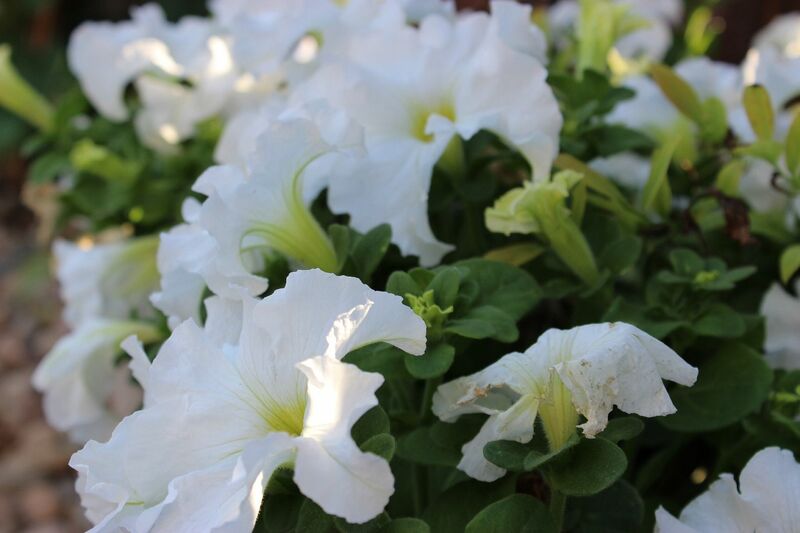 Your garden looks fantastic. I love your garden. You need to come out here and fix mine! I love your garden! It looks like just the right size to me! You have to have that balance, because if it is too big you won't have any time to enjoy it. You are right. It is to small then you can't get creative with it. 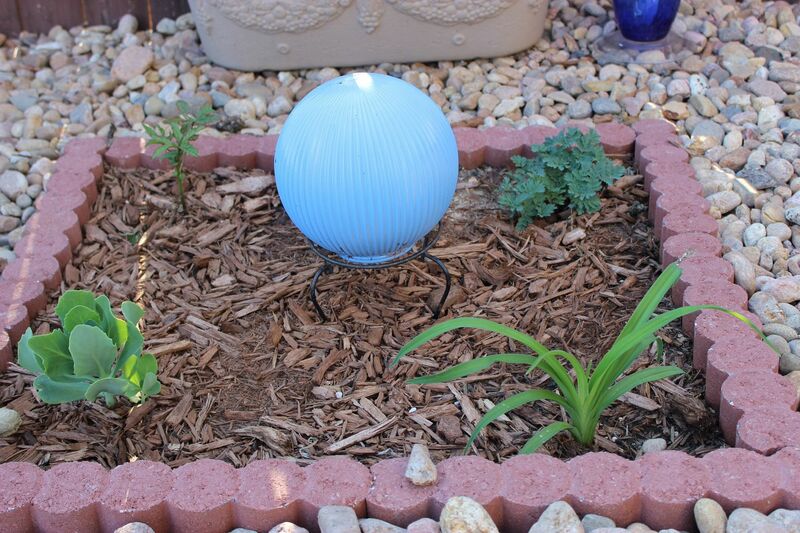 This looks so cozy and lovely and you have so many things growing! I'm jealous Kathe, I had wanted to have a veggie patch when we moved to this house but there is not a good spot in the garden for it especially as we have sloping ground for the better section. We grew tomatoes years and years ago and it would be great to do so again but in NI we need greenhouses for that. Wishing you a good crop of tomatoes. 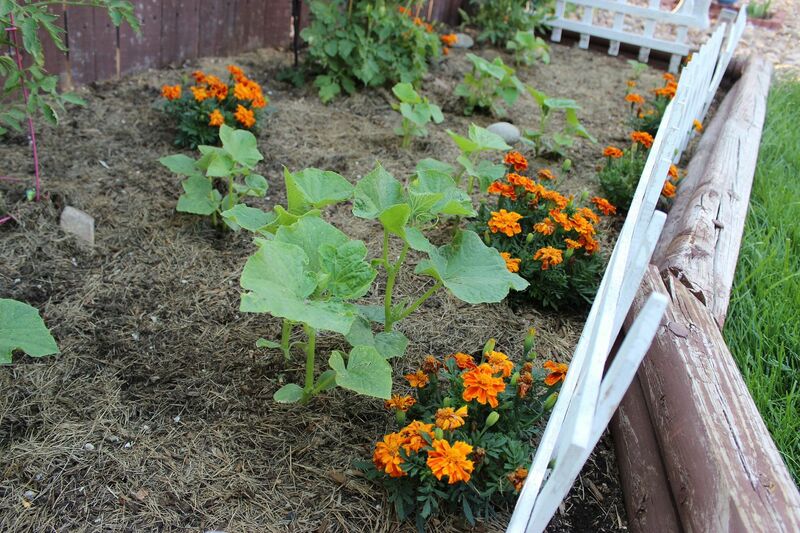 You garden is looking great Kathe! We've tried in the past and our tomatoes would always get bottom rot or split open. We are just growing hot peppers these days. Wow! It has grown a lot! I love that you are embracing your small space and making it beautiful. Lovely! It must be a challenge to work in a small space. 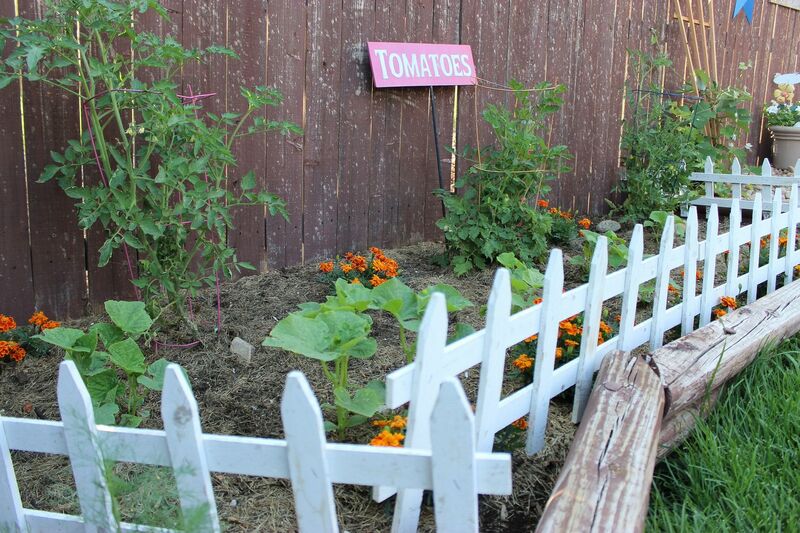 Your tomatoes and cucumbers are coming along very nicely. 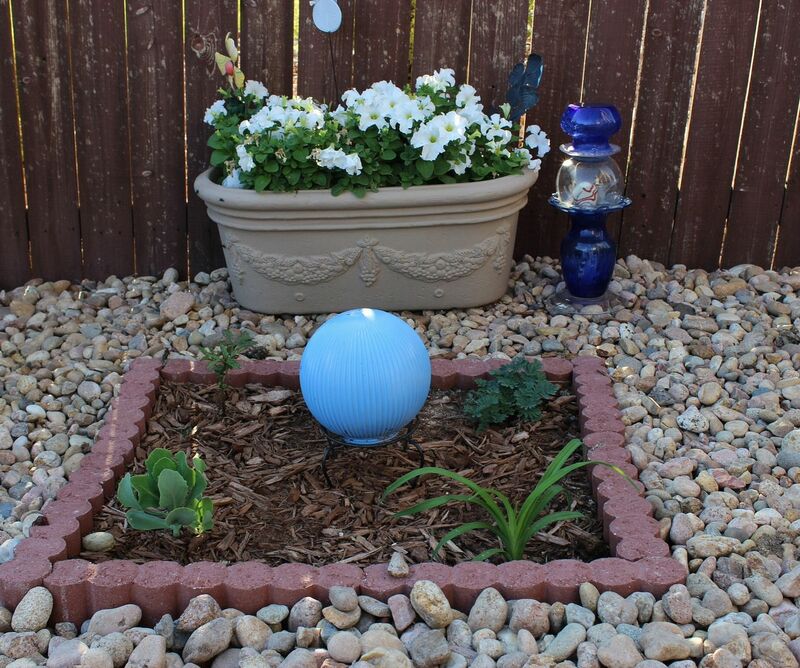 The little garden for the Grandchildren is a great idea, yours is a just the right size for a child to help take care of. 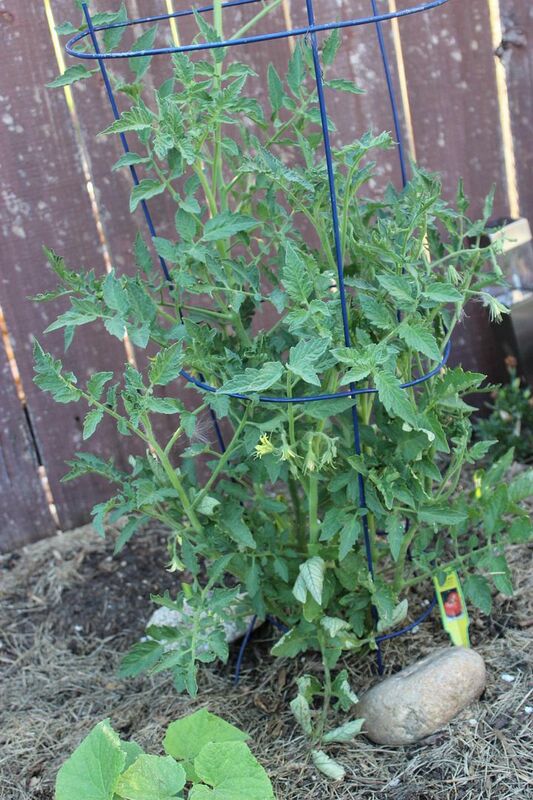 After the hail and the torrential rains last month my tomatoes were nearly wiped out. They are starting to recover and we may have some tomatoes later in the season. It's growing great! Sometimes we have a little sit back too but we still have a great harvest. 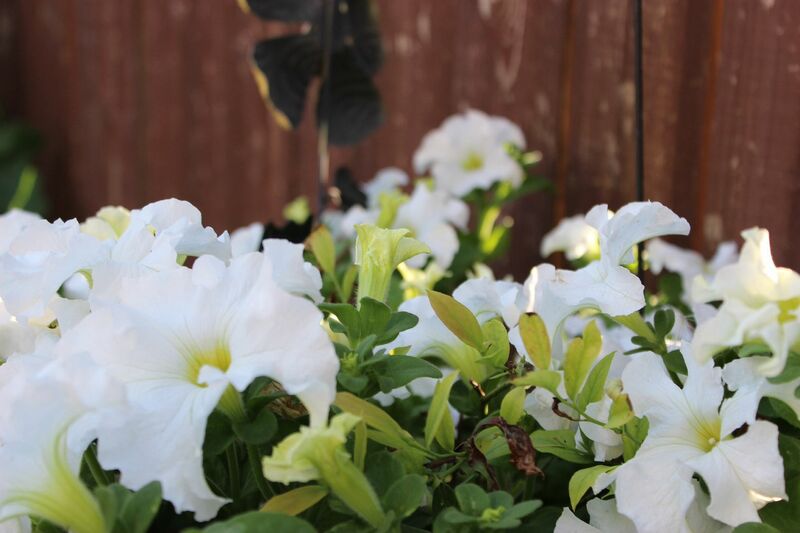 I'm so jealous of your garden. I'm in Florida and we've picked the last of the tomatoes this week. But looking on the bright side, I get my husband back now. lol Large gardens are so much work. Every year he says he is going to downsize but he never does. Thanks for sharing with Creative Spark Link Party. I hope you join us again tomorrow.